Make your balcony pop with colour and fragrance. It takes a little bit of effort to bring our balconies back from the depths of their winter hibernation. Sweeping, scrubbing, glass cleaning and reviving furniture are all in order, before you think of decorating. But once you’re ready, and now that it is once again warm outside, it’s time to bring the outside in and increase your living space. Whether you have a sweeping 1,542-square-foot, south-facing terrace, like the largest penthouse at the new Gotham development, or a slim eight-foot balcony with views of another building, you can adopt this indoor/outdoor philosophy, especially through colour and fragrance. Brantim Country Garden Centre is a green thumb’s paradise specializing in flowering baskets and commissioned by many restaurants and commercial buildings. Recently, I caught up with Brantim owner Joanne Smith to get her advice for condo plantings and current trends for balconies. Smith’s No. 1 advice is to stick with insert planting. She recommends planters by Barracuda, which are low-maintenance and come with a 10-year guarantee. You can find them at many places, including Ritchie Feed & Seed and Home Depot. Because of their double wall of resin, these planters are durable to the point of being able to withstand our harsh Canadian winters. Depending on the design, Barracuda planters range in price from $100 to $2,000. They are ideal for planting 20-to-26-inch flowering inserts. For these kinds of plantings, Smith suggests you fill your container with used plastic water bottles or used soda cans, then insert your flowering baskets. This gives your floral bouquets a lift, while also providing your recyclables a second life. In the winter, Brantim also sells birch sticks, berries and pinecones for filling containers. These seasonal items, coupled with sparkling twinkle lights, are the perfect way to extend your balcony’s use into the winter months in a unique and festive way. Another useful way of condo gardening is to plant groups of herbs among your flowering plants. This is a great way of actively using your garden — by growing herbs — while simultaneously enjoying the visual of the space. For those who love to cook or simply love fresh herbs in cocktails and iced tea, this could be fantastic. Grow some basil and make a basil and cucumber cocktail like the ones they serve at Nordstrom’s Bazille restaurant, or add fresh dill to your Sunday morning omelette. While we’re talking edibles, Smith also recommends planting tomato plants so you can enjoy these throughout the summer. This versatile fruit grows very well in planters and is perfect for condo balconies. To Smith’s advice I’d like to add my own experience shopping for outdoor furniture around our city. HomeSense, for instance, carries a variety of planters. I picked up some beautifully woven planters from Vietnam all with special inserts that make stuffing your planter unnecessary. 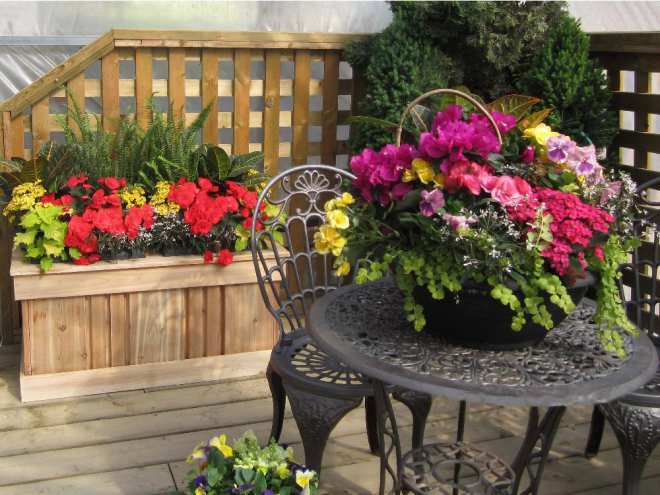 Costco and Home Depot also have good selections of planters in various designs and materials. You may find the perfect planter in the most unlikely places, so don’t give up your search. Hauser on Carling Avenue offers brilliant solutions for filtering the sun in the forms of sun shades, umbrellas and covered screened tents. Depending on the size of your balcony, these may be useful additions. Home Depot and Costco also offer structured tents, but Hauser can order yours in one of your favourite colours. This spring is the ideal time to spruce up your balcony. Think about bringing the outdoors in and planting in creative ways that are both functional and esthetic.